Alcala Labs is pleased to introduce CleanAssureTM. 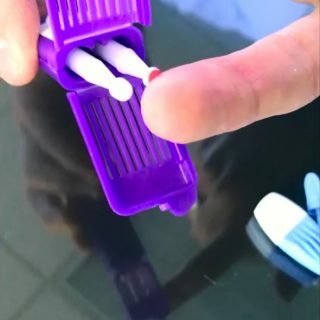 This technology, which uses a simple finger prick, collects a small amount of blood onto a volumetric absorptive tip (VAMS™ – Volumetric Absorptive Microsampling technology). The sample is overnighted to the lab to test and provide qualitative and quantitative results with precision. No longer do facilities have to deal with the mess of urine or trust that a sample is unadulterated. Face to face with the client, the blood sample is collected. Test for drugs accurately, or face the consequences. A trend is growing in California. Drug and alcohol addiction recovery facilities are facing unprecedented legal liability. Consequences ranging from murder charges, loss of licensure, and civil liability compel an internal assessment of all aspects of care. Chief among them is the use of drug testing to ensure that a client is abstaining from drugs of abuse and is appropriately evaluated for the presence of illicit and licit drugs that impact recovery. It is commonplace for facilities to use point of care means of sample collection that give a quick, binary or “yes” or “no” result from a urine sample. This method relies on three fallible components: honesty of the client to provide an unadulterated sample, reliability of the binary result, and an inability to report whether a finding reflects chronic drug use or something else. Few people know that this method will not detect drug use as recent as 24 hours before the sample was taken. Quantitative testing is the standard. At Alcala Labs, we specialize in providing quantitative analysis of the samples sent to us. We can determine with precision, in laboratory analysis that does not report false positives or false negatives, precisely what drugs are present in a client, and the scope of the potential problem based on the amount of drug found. In fact, we can identify over 200 unique compounds, including the latest synthetic drugs. Call today to set up your free in-service testing. Alcala Labs’ scientific, medical and legal team is ready to schedule your free in service to introduce this new technology. Call us at (619) 540 5870, and speak to our Team at Alcala Labs.